The EIG is a flexible and loosely structured platform for communication and coordination among STI agencies of European countries and Japan interested in collaborative research. The EIG CONCERT-Japan consortium is comprised of partner institutions entered into a simple Memorandum of Understanding to continue the collaboration established in the ERA-NET CONCERT-Japan in further joint calls. 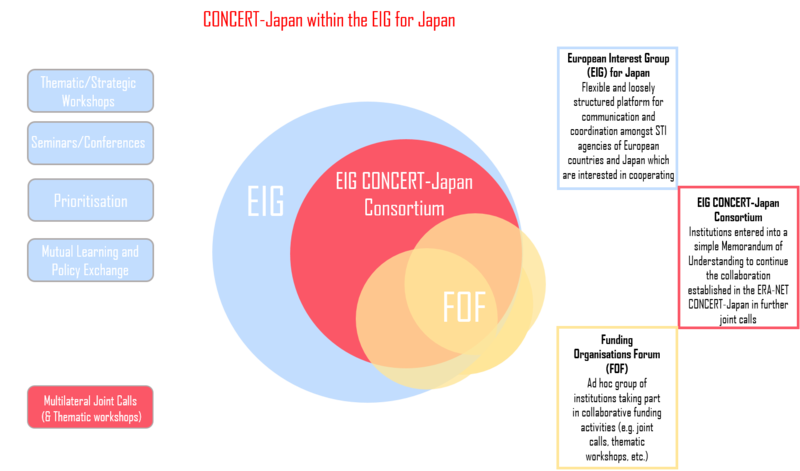 The Japan Science and Technology Agency (JST) is the coordinator of the EIG CONCERT-Japan. The National Center for Scientific Research in France hosts the Joint Call Secretariat (JCS). It is responsible for the implementation and operational management of the EIG CONCERT-Japan Joint Calls. The JCS is in charge of the reception and eligibility check of the proposals, the selection of the panel of evaluators, the supervision of the reviewing procedure and the communication with the applicants. The Funding Organisations Forum (FOF) is an ad hoc group of institutions taking part in a particular collaborative funding activity (e.g. joint call, thematic workshop, etc.) . They are formed on a call-by-call basis, and can be freely entered by new institutions without joining the EIG CONCERT-Japan Consortium. The FOF elects the call topic and selects the projects to be funded. The influence of the FOF will be limited to each joint call and not decision-making structures of the overall CONCERT-Japan program.